June 1–2, 2019: Mark your calendars for our first-ever Seagrove Wood Fire NC Weekend Pottery Tour. On the first weekend in June (Saturday and Sunday, June 1 & 2, 2019), you are invited to join us for two days of kiln openings, studio tours and a Saturday night meet-and-great featuring a local food truck and microbrews. Learn more about the Seagrove tradition and wood-fire kilns. Talk with our potters about their craft. And enjoy the wide-open spaces in and around scenic Seagrove. We look forward to seeing you! ADMISSION IS FREE, ALL WEEKEND LONG. Husband-and-wife team Takuro and Hitomi Shibata from Studio Touya arrived in Pittsburgh, Pennsylvania, yesterday for the CrossCurrents: Clay and Culture conference of the National Council on Education For The Ceramic Arts (NCECA). Takuro, the director of STARworks Ceramics, is a resource hall exhibitor at Booth 604, where he and Adam Wiley are making the wild clays of North Carolina available to potters from all over the country. Today, Hitomi (shown here) demonstrated the art of throwing a large platter using wild clay from North Carolina. Michael Mahan at From the Ground Up Pottery calls his latest native clay—dug from land on the family farm in Ireland where his wife Mary Holmes grew up—Curious Bovine Clay or CBC for short. He prepared 100 pounds of CBC this past summer during one of their annual trips to visit with relatives and friends in Limerick, Ireland. The Irish farm has been in the Holmes family for hundreds of years, traditionally as a dairy farm with some tillage to provide food for the farmers and their livestock. 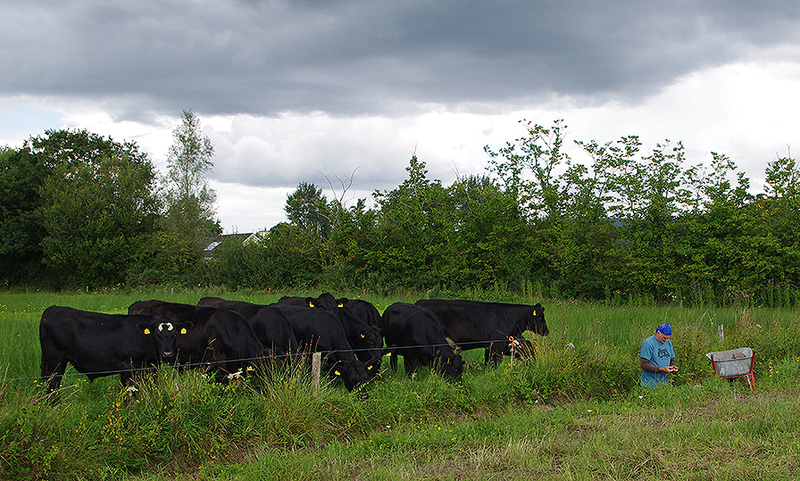 The current generation raises beef cattle. When Michael and Mary head back to the farm this June, he'll be throwing pots with Curious Bovine Clay in the pottery shed he and Mary built on the property some six years ago. Those CBC pots may find new homes in one the Irish galleries representing Michael Mahan; or at a crafts exhibition in country; or at a booth at the Galway Potters’ Market during the Galway International Arts Festival this July.